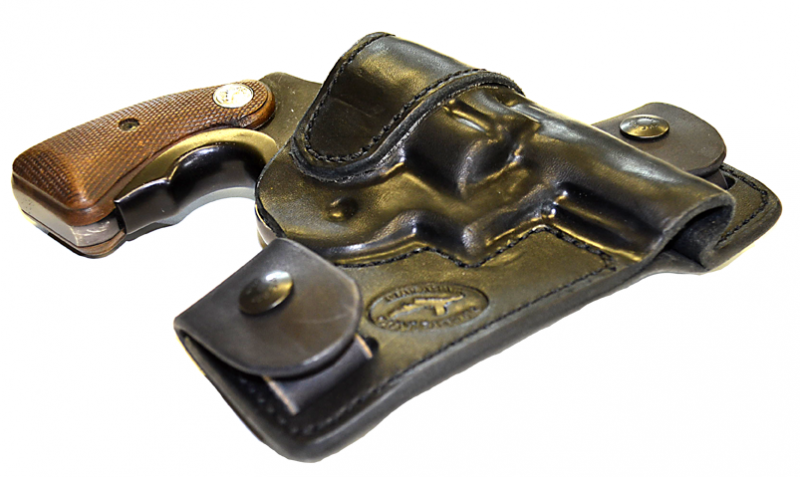 This is a special version of our best-selling holster, specifically adapted for revolver crossdraw. It's best for revolver shooters who have mobility issues, or spend a lot of time in the car. This is a highly-engineered holster that pushes the limits of leather construction. Although it is designed for CCW, it is equally at home in IDPA or tactical classes. It can be removed instantly from the belt without the need to remove the handgun from the holster -- a huge plus for a civilian who carries concealed every day. -- a molded-in sight track. -- a steel band in the throat for adjustable retention and easy reholstering. The band pulls the hardened leather around the base of the cylinder for snug retention. -- a leather guard to keep the hammer and spur from biting into your side. -- instant mounting and dismounting from the belt using replaceable leather straps. -- military grade, Pull-The-Dot, one-way snaps. -- a higher ride that pulls the holster tight to your side, and keeps the bottom of the holster from sticking out from under your shirt. -- a 30-degree cant to enable easy draw. 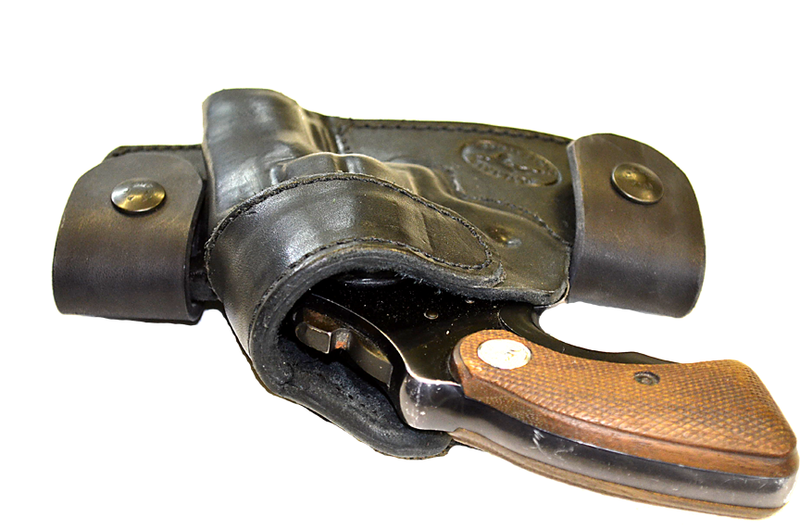 -- replaceable leather straps that lock the holster to yout belt with military grade Pull-the-Dot one-way snaps. The standard cut of this holster is for a 1.5" belt. If you intend to wear it with a different size belt, please let us know. Pricing: $85, in black, russet or natural Hermann Oak cowhide, for revolvers with short barrels barrels; $95, in natural tan horsehide, for revolvers with short barrels.